Lock in a great price for Grand Hotel Spiaggia – rated 8.7 by recent guests! The staff were so lovely and could not have been more accommodating. The hotel itself is recently updated and very clean. 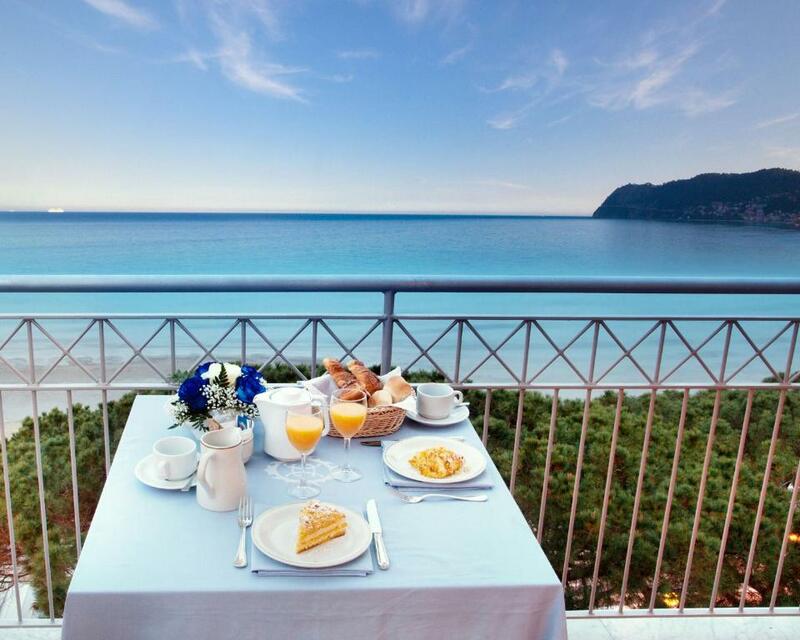 Excellent breakfast room with a fantastic view and a good offering. Location is brilliant as well. 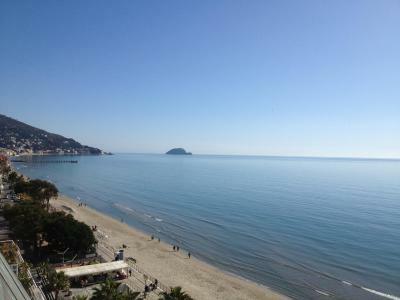 very close to the heart of Alassio. Renovated room. Friendly staff. Veryyyyyy nice hotel. Veryyyyy good location . Staff was perfect !!! We loved this hotel.clean .very comfy beds. Very friendly staff, clean facilities, situated by the beach. Nice top-floor restaurant with breathtaking view of the Mediterranean coastline. Good breakfast selection. Amazing view, especially breakfast room. wonderful breakfast. On the beach. Recently renovated, nicely. Very close to the beach, nice room with a balcony (sea view). Grand Hotel Spiaggia This rating is a reflection of how the property compares to the industry standard when it comes to price, facilities and services available. It's based on a self-evaluation by the property. Use this rating to help choose your stay! One of our best sellers in Alassio! 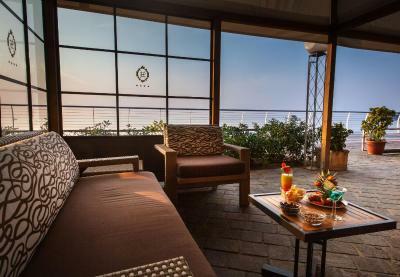 With a beachfront location in Alassio, Grand Hotel Spiaggia is set in its own garden and features a rooftop swimming pool and a restaurant. A private beach are is also available. 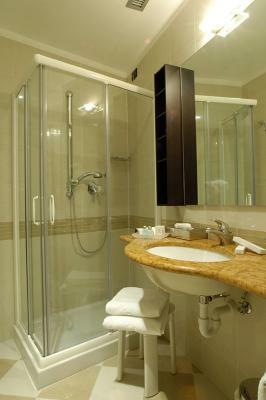 All rooms are modern and elegantly decorated, boasting design furnishings and modern design curtains. Each is provided with air conditioning, a flat-screen TV with satellite channels, and an private bathroom complete with toiletries. Some rooms come with a private balcony, and some offer sea views too. At the Spiaggia Grand Hotel you can relax and enjoy the sun, either on the rooftop terrace equipped with sun loungers and parasols, or by the swimming pool. The pool is located in the rooftop, and it has whirlpool features. Breakfast is a varied buffet, offering sweet and savory products such as cereal and croissants, together with cheese and ham. The hotel’s restaurant is open for lunch and dinner, and specializes in Mediterranean cuisine. Vegetarian and gluten-free options are available on request. At an extra cost you will also find deckchairs and a parasol at the private beach area, as well as towels for sunbathing. Alassio Train Station is a 15-minute walk from the hotel. Genova Colombo Airport is a 1-hour drive away. When would you like to stay at Grand Hotel Spiaggia? This elegantly decorated room comes with a small double bed. It features air conditioning, a flat-screen TV with satellite channels, and an private bathroom complete with toiletries and a bathrobe. 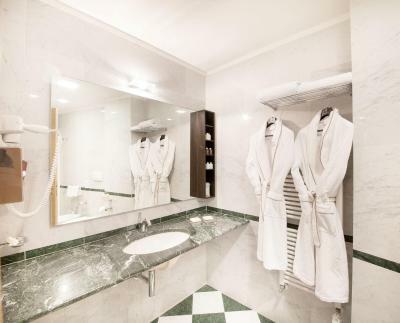 This larger and elegantly decorated room features air conditioning, a flat-screen TV with satellite channels, and an private bathroom complete with toiletries and bathrobes. This larger and elegantly decorated room features air conditioning, a flat-screen TV with satellite channels, and a private balcony. Private bathroom is complete with toiletries and bathrobes. This larger and elegantly decorated room features air conditioning, a flat-screen TV with satellite channels, and views of the sea. Private bathroom is complete with toiletries and bathrobes. Spacious junior suite boasting a private balcony with sea views. It features air conditioning, and a flat-screen TV with satellite channels. This elegantly decorated room features air conditioning, a flat-screen TV with satellite channels, and an private bathroom complete with toiletries and bathrobes. 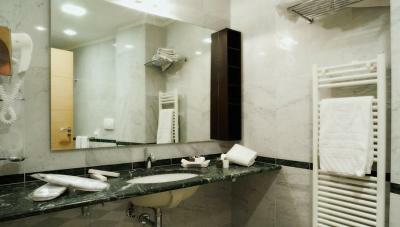 This smaller room with attached bathroom comes with a small double bed and a flat-screen TV. 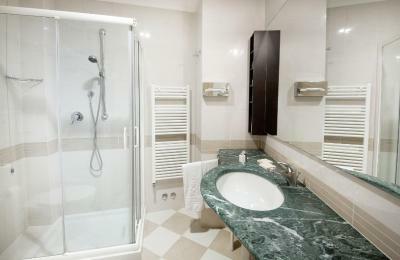 House Rules Grand Hotel Spiaggia takes special requests – add in the next step! ATM card Grand Hotel Spiaggia accepts these cards and reserves the right to temporarily hold an amount prior to arrival. Grand Hotel Spiaggia accepts these cards and reserves the right to temporarily hold an amount prior to arrival. If traveling with pets, you must write it in the Special Request Box when booking, and contact the hotel immediately after booking. 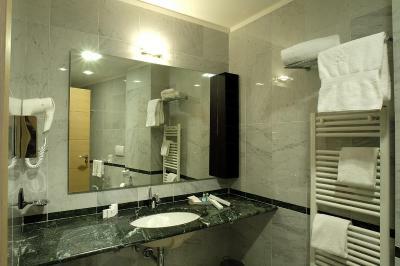 Pets can be accommodated at an extra charge of EUR 29 per night, due for a special final cleaning of the room. Pets are not allowed at the restaurant, at the pool and at the private beach. Please note that the swimming pool is open from 10:00 until 19:00, from June until September. Please note that air conditioning is available from 01 June until 15 September. Lovely restaurant for breakfast with great view. The bed was not very comfortable which is a shame as we really like our room. My room was quite small, with no place to place your suitcase for unpacking. The underground garage is small, making it difficult to park and maneuver. €29 expensive for a pet and parking very expensive at €25 too! A little walk from the town, but pleasant. It was off season early October so hotel was semi shutdown, no pool bar, no aircon & it was hot, no Promenade lounge etc. better rate, but no ambiance. Strange seating arrangement at breakfast. You couldn’t sit wherever you wish even if you are the first to come. The car parking arrangement was slightly complicated by having to have the car parked by staff and then requesting the car keys whenever we wanted to use the car to make a visit to the region. The room we were given was excellent in comfort, style, size and views. The hotel dinners we had on 2 evenings, had a good selection of choices, and were reasonably priced. The staff were friendly and helpful at all times. The Parking was a bit pricey, but necessary. Lovely dining/breakfast room with panoramic views. Rooftop pool and solarium. Welcome was courteous and friendly Superb staff on Reception. Bedrooms were very good, we had small balconies with wonderful views of Alassio's perfect beach. Short walk into main centre and activities. Exceptional breakfast buffet and really good value Dinner with good service. Loved every thing about this hotel and looking forward to visit again in the future. Comfort of the rooms restaurant was perfect waiters were so helpful. The receptionist were very professional and made sure our needs met. Beach across the hotel was perfect.